Fargo is an amazingly true story that is basically fictionalized, but which is also based on real events. The first thing we see is white lettering on a black background: THIS IS A TRUE STORY. It claims that although names were changed the rest is told, out of respect for the dead, exactly as it occurred. Director of Photography Roger Deakins has since stated that it was more so based on a series of unrelated events tied together by a fictional narrative. I’ve also seen Ethan Coen quoted as saying ‘the script pretends to be true’. None of this is all that important, really. Fictional or semi-fictional, this movie is so engaging that the terms ‘true’ and ‘not true’ become almost arbitrary and irrelevant, save for the fact that from the onset they create a pretty cool air of mystery that makes the proceedings that much more unsettling. Poor Jerry Lundegaard (William H. Macy). Things should have worked out better for him. He’s got a loving wife and son, a nice house and a sweet job selling cars for his super rich father-in-law. But Jerry isn’t the smartest man in Minnesota, and he’s having money problems. He figures the easiest way to financial freedom is an elaborate plan to have his wife kidnapped thereby screwing his father-in-law out of a million dollars worth of ransom. But Jerry soon finds out that you can’t always count on the weirdos your mechanic recommends to help you fake kidnap your wife. A bloodbath ensues as the two kidnappers cut a clumsy swath of death across Minnesota. To the extreme detriment of their fast deteriorating plan, they are being pursued by Police Chief Marge Gunderson (Frances McDormand). Would it…kill you to say something? Marge Gunderson is, for my money, one of the most fascinating and well-drawn characters in film history. She is tough and extremely capable, while at the same time having a vast capacity for compassion for her loved ones and killers alike. She is basically the alpha figure in every aspect of her life. Seven months pregnant and still doing active field work. Her police work is sound and superior to that of her colleagues; she is respected and desired by her (albeit mentally unstable) former classmates; she has a devoted husband who will wake up unreasonably early to make her a nutritious breakfast before work. She is the physical embodiment of righteousness and a stark contrast to Carl Showalter (Steve Buscemi) and Gaear Grimsrud (Peter Stormare), two essentially amoral low-lifes who never think before they shoot. 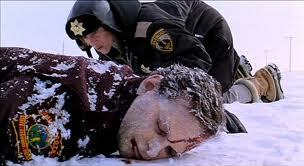 Come to think of it, Jerry Lundegaard’s incredibly weak will is in stark contrast to Gunderson’s intense resolve. Is it annoying to describe Marge Gunderson as a modern day folk hero? Feels annoying. But I’m going to anyway. Marge Gunderson is a modern day folk hero. Against the ever more blood soaked back drop of these alleged true events, her virtue seems like the reward here. But maybe I’m just a ‘wood-chipper half-full’ kind of person. Fargo will be playing on Thursday, November 28th at 6:30 as part of TIFF Bell Lightbox presentation of Joel and Ethan Coen: Tall Tales; a ten film retrospective of the work of the Coen brothers. Go to tiff.net for additional information.